It's hard to put in words our gratitude to Abba Canada! When we received the phone call that we would receive this grant we just stood amazed at God's goodness, and providential care for us!!! We have had a lot of ups and downs in this journey, and at times have wondered if we could possibly continue. When we heard from Abba Canada it was an amazing encouragement and brought tears to our eyes! We're just so thankful for them and the work that they do to help families who are adopting! Since before we were married John and I talked about adopting one day. It was a great desire God had placed on our heart. When God closed the door to having more biological children we felt now is our chance. My mother was a foster child, and we saw through her the great blessing a Christian home can be. We didn't know if we could ever be that, but the desire to be able to provide a child with a loving home was planted in our hearts. We had watched a documentary about Nigeria. We had seen how so many Christians were being killed there, and because of that there were many children left without a father or mother. We also learned about the aids crisis, and the need for children affected by aids to have families. The more we learned the greater our desire grew to be able to adopt from there, and provide a child in need a loving family! 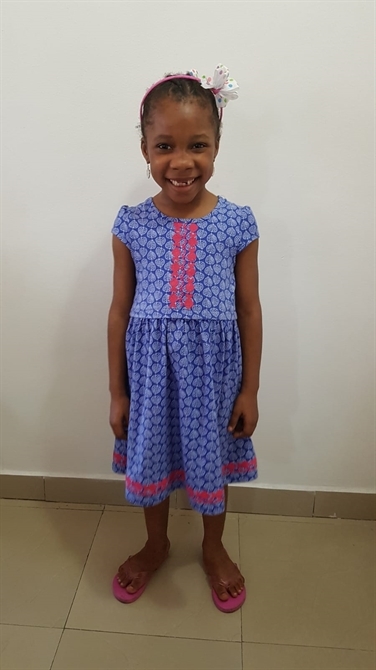 A few months after watching that documentary, our adoption agency opened up the doors for Canadian families to adopt from Lagos Nigeria. At the moment we're waiting for Lagos ministry approval. Once we receive approval we will fly to adopt our little child. We will need to stay in the country up to 4 or 5 months. We're so thankful to Abba Canada for their generous support, and even more so for their great encouragement!!! We pray that God will continue to grant Abba Canada all that they need so they can continue helping families!! THANK YOU!!! love John, Erin and family!!! Hi everyone, so sorry we did not do an update sooner! 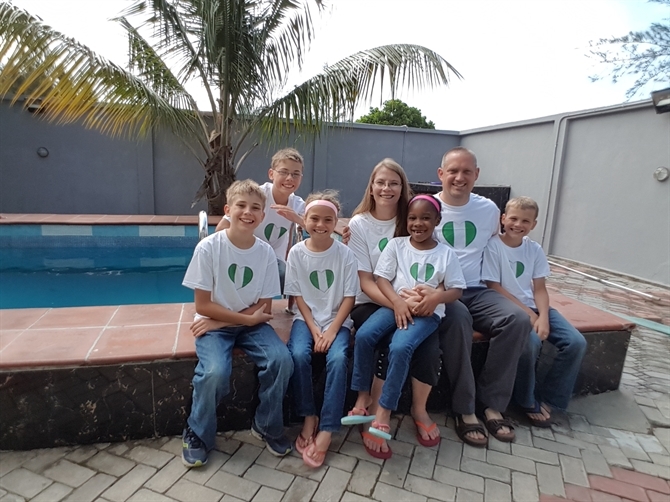 We arrived in Nigeria on June 26, and we completed the adoption July 12, 2018! It has been very busy the last few weeks! We met Favour on June 28, and went to visit her at the orphanage every day for the first week. After that time, she came to live with us. We have been so blessed with our new little girl! It hasn't been perfect, but God is really blessing it! Little children would be adopted from the orphanage, and Favour would become sad, and ask, " When is my mommy and daddy coming?" So, she was pretty excited when we came. The first day she was shy, but quickly after became the bubbly little girl she's known to be! We're so thankful to the Lord for His blessings through this all, and His continued care of all of us! We miss our children back in Canada, and our hoping to bring them here soon. We're thankful for Abba Canada's help, and know we could not have done this without them! Please pray that God will continue to supply our every need! The expenses are very high, but we see God is continuing to answer prayers and provide! The day of court was a very long day. We were told we were to be at court at 9am, so our driver picked us up at 7am in the morning. When we finally got there, we found out the court wasn't going to take place untill 2pm. We went to a mall and hung out. We came back around 1:30pm, and waited for hours. At about 4pm the judge arrived. Somebody had picked up the wrong document, so then we waited for them to go and get it. So we finally saw the judge around 5:30pm! We were so thankful though, that we could still see her, and that Favour is now our daughter! When you experience all that goes into an adoption, you know that it's only the hand of God that can bring these things to pass! So many obstacles, and so many things need to fall into place! We praise the Lord for His goodness! Thank you for all your love and support, and continued prayers!! We're so excited to finally have our family all together. John flew back to Canada and picked up our other 4 children. It was a long and tiresome journey, over 30hr trip, as they had a huge lay over, but they have all arrived safe and sound! Things are going well in Nigeria. We're starting to settle in here, and are so happy to have all our children together. Favour is enjoying her new brothers and sister. She loves it when they give her piggy back rides, and play hide and seek with her. She laughs and squeels with joy! We have been so blessed with her, and she is adjusting well to our family. She makes sure I sing, pray, and tuck her in bed every night. She gets really excited about the little things, we take for granted. We recently took the children to see the orphanage where Favour came from. It was an emotional day. John was greeted by a 12 year old boy, who he had got to know a bit. He ran up and gave John a hug. He then asked if we were going to adopt him now. John had to tell him we weren't able to. When we left, he started to cry. It really broke our hearts. We would love to have given him a home, but because of the costs, and Ontario's laws about adoption, we're not able to. Then there is this little girl with casts on her legs. I asked if I could hold her. I was told, if I hold her, she'd always want to be held. So I went over to the younger ones and held one. She looked at me with tears pouring down her face. She desperately wants a mom and dad and someone to love her. It really broke our hearts. All the children desperately want families, and it's so hard when you feel you're unable to help. We pray that God will provide families for all these children. I recently got malaria, and am being treated. It's taking a while to get strength again. Please pray that our children would not get it. Malaria is very common in Nigeria, but is dangerous if not treated quickly. We continue to stand amazed at God's providing hand in so many ways! He has provided a wonderful Church family here too. They have made us meals, and pick us up for Church.